Cape Cod is a true inspiration to artists across the board--writers, painters, sculptures and more. The standard holds true for photographers as well. Whether you are a professional photographer or you just love to dabble in the world of the shutterbug, the Cape is a treasure trove of timeless images waiting to be captured. Here are some ideas for great shots on the Cape. The Bay. Cape Cod Bay has some of the most dramatic flats in the world and they look especially brilliant when lit up by the sunset. Brewster and Dennis in particular have some of the best bay beaches for getting great shots. Wander a town. But what's wrong with typical? Cape Cod has a unique charm that exudes from everything, buildings and locals included! Take some time to thoroughly explore the town of your choice and you are sure to get some fabulous shots. Go out on a boat. There are many tours offered on the water and some of them will take you by places that you may not have the chance to really capture from the land. Night and day. Another fun set of photos can be the contrast of a particular location from day to night. Consider the beach, usually host to a variety of people in the day, but empty at night. Or even some of the Main Streets, usually bustling during the day, but less so come evening. 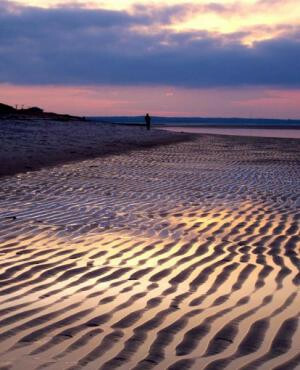 An evening stroll along Mayflower Beach in Dennis on Cape Cod Bay. Photo by Jane Booth.